Monochrome, when the ground is the same color as the sky, and I feel like I’m in a two dimensional world of white. Not that I’m complaining . 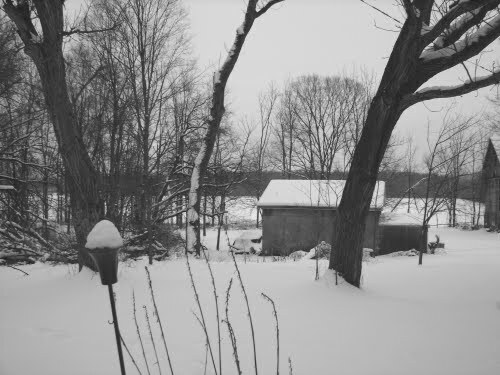 . . a week of steady snow fall every day is exhilarating to me as a writer. Inch by inch, my wonderland inspires as I lounge in my jamies and slippers and sip hot cocoa or coffee and transfer my feelings to the computer screen, chapter by chapter!! How do you view winter weather as a writer??? Any thoughts? Mid, I am one of the few, it seems, that love winter. Even though we do not have snow in the south where I live. The cold weather causes the dying back and dormancy of foliage. In spring it will come back to life renewed and freshened. Winter is a cleaning, a washing away the old and bringing in the new! It is a beautiful and encouraging, as we ourselves go through much the same in the seasons of our life. Sherri, How true…I love your thoughts! Thanks for leaving a comment, girl! !